The rate of recovery I currently estimate at 2.9 mbd/year, with a 90% confidence interval of [2.2, 3.6] mbd/yr (using the same approach as in previous months). 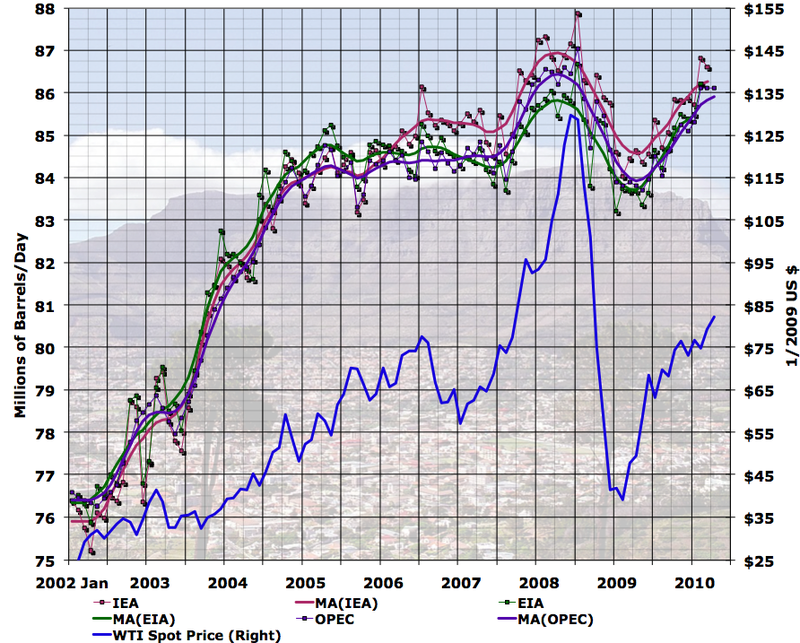 It still appears to me that the most likely outcome is that this recovery will continue and exceed the 2008 peak of liquid fuel production. That's assuming that the European Union has successfully kicked the can down the road a ways on the debt situation - a major flare-up in the financial crisis could obviously kick demand down again. 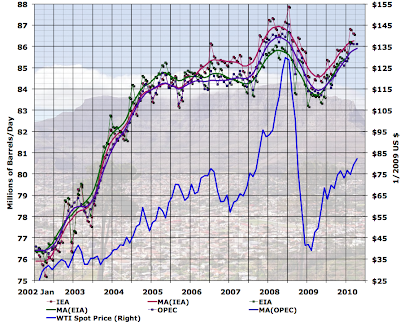 I don't expect the spill in the Gulf of Mexico to have very much near-term impact on global oil supplies one way or the other. In the longer term, it may have a slight negative effect by retarding US offshore production, but that's a pretty small piece of the overall pie (which is why it's not getting much coverage on this blog). 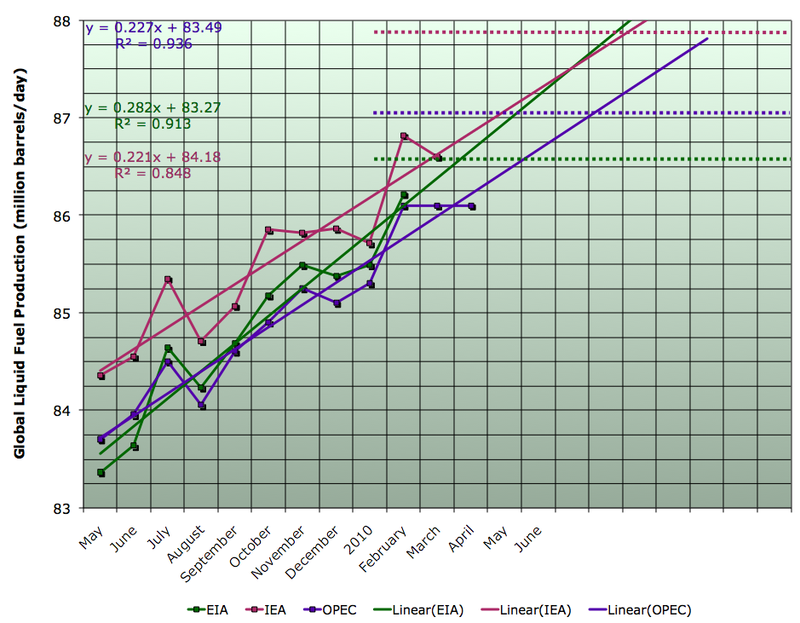 The EIA also have the STEO which gives estimates for up to the previous month. 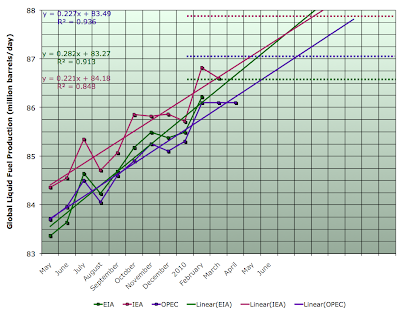 I'm not sure how this compares with the first estimates given in the IPM for that month, but as all these things are estimates anyway (and are revised) could you not use the STEO as the EIA's estimates, to get them level with the other two sources?